A majestic staircase of granite rises some 30 feet above the Brooklyn edge of the East River, revealing a panorama that sweeps from the Verrazano-Narrows Bridge to Midtown Manhattan. A salt marsh lined in limestone offers a contemplative look at the river as ecosystem. Along paths winding up manufactured hills and ridges are hundreds of trees that outline velvety fields of green. 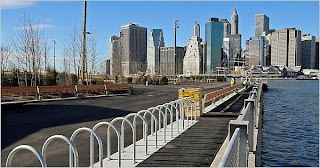 This is Brooklyn Bridge Park, perched atop a ribbon of piers, and already hailed for its design and scope. But the park is taking shape only in fits and starts, and even opening the small part that is complete has been delayed until spring as the city and state hash out questions of money and control. Despite 20 years of planning, work has barely begun on the bulk of the project. The $350 million construction budget is still short $125 million, and no one is sure who will come up with the $16 million needed each year for operations and maintenance. What happens when an unstoppable boat dock meets an irresistable force? The Memphis riverfront is a bleak place in winter when the temperature dips below freezing. 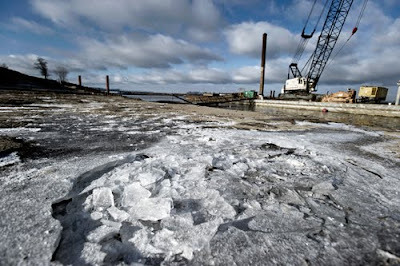 The parks and sidewalks are all but empty, the wind blows in from Arkansas over the dark, foreboding river, and skim ice forms at the edge of the harbor. There's a new piece in the picture this year. A barge crane stands like a giant sentinel at the mouth of the harbor just off the north end of Tom Lee Park. A partially completed iron dam and two red columns jut out of the water. The tip of the park is gouged and cluttered with supplies and equipment. This is the construction site of Beale Street Landing, a boat dock, restaurant, and public space scheduled to open in the summer of 2011. In early January, with temperatures falling to single digits, Beale Street Landing was frozen, in more ways than one. The price of the controversial project has steadily increased since its inception from $27 million to $30 million to $33 million to at least $35 million. The completion date has been pushed back a year. Some of the federal funds that the Riverfront Development Corporation (RDC) was counting on to pay for it have not come through, leaving Memphis taxpayers on the hook for a shortfall of $8.9 million or more.